WASHINGTON – The current inflation measure used to calculate yearly cost of living adjustments for Social Security recipients, the Consumer Price Index (CPI), understates the inflation that the elderly face, an advocate for the program says. And Nancy Altman, co-chair of the Social Security Works coalition, told lawmakers that instead of considering how to cut the cost of living adjustments, Social Security should adopt an alternative inflation measure that more accurately reflects the real costs – especially the higher share of medical costs – the elderly shoulder. Altman’s advocacy came at one of the first congressional hearings, by the House Social Security Subcommittee on April 18, on proposals to reduce the annual cost of living adjustments by basing them to the so-called “Chained CPI,” not the regular CPI. Congress’ ruling Republicans enthusiastically embrace the Chained CPI as part of their drive to cut the budget by cutting so-called “entitlements,” notably Medicare and Social Security. Democratic President Barack Obama also backs the chained CPI. Social Security’s purchasing power. Even with the adjustments, the average Social Security recipient now gets $13,900 a year, Altman says. Altman was a lonely voice at the witness table, defending using the current CPI to calculate yearly Social Security cost of living adjustments. The others at the GOP-run hearing all favored using the chained CPI. She responded that a chained CPI, which reflects consumers switching between goods depending on price – say, buying more chicken when beef prices rise – would deprive the 50 million seniors, 60 percent of whom depend on Social Security for at least half of their income, of money they need. One-third depend on it for 90 percent+ of income. “The proposal to shift to the chained CPI for Social Security and other programs that serve the elderly and those with serious and permanent disabilities is nothing more than a benefit cut masquerading as a technical adjustment,” Altman contended. If Congress really wants to provide for Social Security recipients, it should shift the base for the adjustment from the CPI to a separate price index, now unused, the CPI-E, for “elderly.” The CPI-E changes the basket of goods used to calculate yearly inflation, by lowering the share of the basket for services the elderly use less, such as recreation, and increasing it for the services they use more, principally medical care. The Republicans also contend Social Security contributes to federal red ink, an accusation Altman roundly denounced as untrue. Federal law, she notes, bars Social Security from borrowing from the Treasury. Indeed, it’s run a surplus since 1983, relying on money from payroll taxes and its investments in Treasury bonds. “As people aged 65 and older grow to a projected 20.2 percent of our population in 2050, the nation is projected to allocate only 6.1 percent of gross domestic product to the provision of the basic necessities through our Social Security system. Congress could easily alleviate the pending retirement income crisis” – due to, among other causes, disappearing traditional private pensions and wipeout of 401(k) values in the Great Recession – “by increasing Social Security. 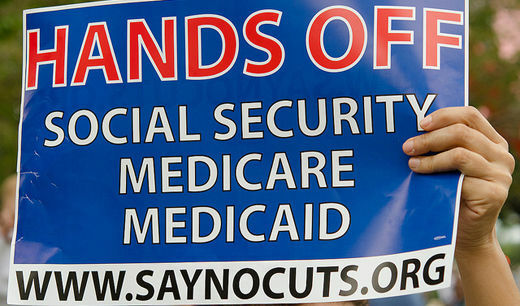 Cutting Social Security will exacerbate the looming crisis,” she testified. “Whatever is done, though, it should not be done as part of a deficit reduction package,” Altman said.